All your favorite TDE artists, under one roof for what potentially could be a once in a lifetime concert. 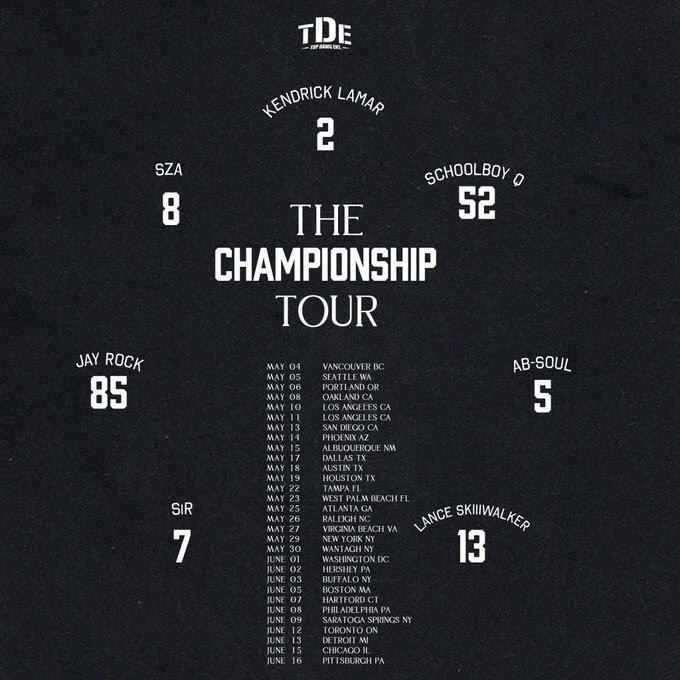 TDE (Top Dawg Entertainment) and Live Nation have announced the star-studded TDE roster will be hitting the road come this Spring for The Championship Tour. Kendrick Lamar, SZA, ScHoolboy Q, Ab-Soul, Jay Rock, Lance Skiiiwalker, and Sir will all be on deck. The Championship Tour is scheduled to hit 30 cities, beginning in Vancouver on May 4th and the ending in Pittsburgh on June 16th. Chicago did make the list – so Chicago TDE fans can expect the tour to hit the city on June 15th emulating from the Hollywood Casino Amphitheatre in Tinley Park, IL. Tickets for The Championship Tour go on-sale this Friday January 26th, with the addition of password presales beginning on Tuesday, January 24th with a Live Nation presale and more presale opportunities happening on Thursday, January 25th.